It’s some weeks ago when I took the photo you see in this post, I actually thought that I need to delete the image. The photo was bad as I couldn’t zoom in enough to show the bird but today I noticed that the photo was sharp enough even after cropping with Photoshop. The result is that I can now basically show you the photo as if I would have had a tele lens on my camera. 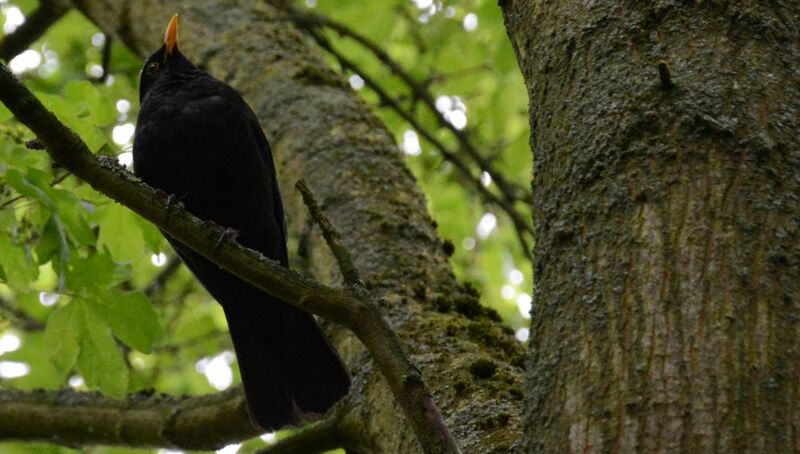 I think the bird should be a common blackbird, they have orange beaks and orange rings around the eyes. I wonder what he was looking at. I love the contrast between the black and the bright green. It is nice and sharp too. Black birds are hard to shoot. I haven’t had any of my blackbird photos turn out well enough to share. I’ll keep trying though! I don’t know what I’m doing a lot of the time either. I was just shooting snapshots with a point and shoot camera until this past January when I bought my Sony a5000 to learn on. I’ve learned a lot, but I often forget most of what I’ve learned when I’m out taking photos! Practicing frequently is helping though.